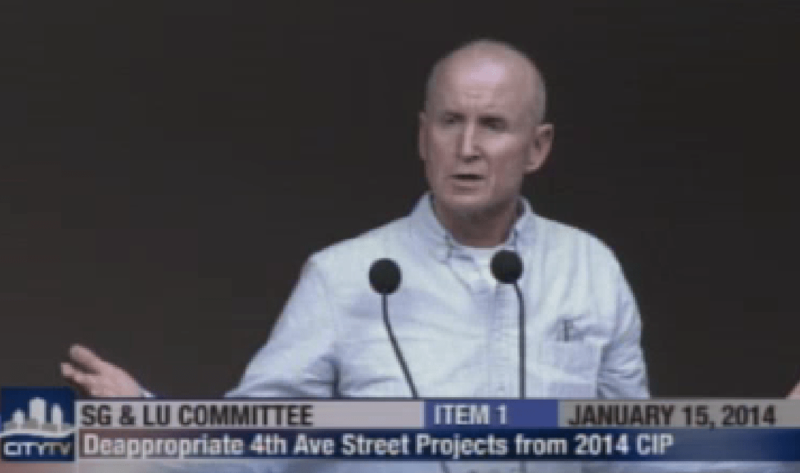 Leo Wilson, Chair of Uptown Planners, doesn’t consider the voice of his bicycle riding community worth listening to. Screenshot from Land Use and Housing Subcommittee hearing. Sign the petition calling on Leo Wilson to resign from Uptown Planners. Last month on July 8th, I sent an email to Leo Wilson, current chair of Uptown Planners Community Planning Group. The emailed called for him to resign from the Uptown Planners Community Planning Group. Uptown Planners is the city recognized Community Planning Group that serves as an advisory board to the City of San Diego regarding land use and development projects in the neighborhoods of Bankers Hill, Hillcrest, Mission Hills and University Heights. In 2010 under Wilson’s leadership, Uptown Planners rejected the city’s plans to install bike lanes (stripes of paint) on India Street and Kettner Boulevard. Wilson stated (with zero evidence to back up his claims) that “the plan’s impact [was] extreme to small businesses,”. I have yet to find evidence anywhere in the country that dedicated bike infrastructure negatively impacts businesses. Today, we have sharrows on India street where someone on a bicycle is expected to “share” road space with a multi-ton vehicle that could kill them in an instant. More recently, Uptown Planners, under Wilson’s leadership, opposed the implementation of the buffered bike lanes on 4th and 5th Avenues. Despite giving Wilson the benefit of the doubt and the time to demonstrate that he simply didn’t have a bias against bicyclists, he has demonstrated time and time again that the only perspective he cares about are some of the out of date views on driving, while simultaneously advocating for the storage of private vehicles on public space – our city streets. A community leader needs to be both reasonable and open to perspectives from everyone. Wilson has demonstrated, as recently as yesterday, that the only perspective he cares about are drivers while voicing opinions with no basis in fact. For more than nine years, Wilson as the head of Uptown Planners has shown no initiative or leadership to accommodate anyone by drivers. It’s time he steps down so that someone who is a true community leader can actually lead Uptown to the future. Elderly gentleman riding in Uptown on University Avenue. Wilson doesn’t think this gentleman’s needs are important. I feel for you man!! Power to the people and don’t let them infringe on our right to enjoy two-wheelin. The only thing I think would be fair so that our voice is heard loud and clear is that we pay taxes on our bikes and then we can say we demand fair representation. We’re tax paying citizens and we demand equal representation. After all, we have Mayor Gloria in our pocket, why stop there!! Let’s invade Sacramento and get Jerry to help our cause!! Legalize marijuana while were at it, so we can really get our money’s worth. Let’s start a petition for taxing our bikes and legalizing drugs!! Free love, bikes, and drugs. It just doesn’t get any better. Larry Jones, we are already paying taxes! The building and maintaining of surface (non-freeway) street mostly comes from general taxes that EVERYONE already pays. Gas tax and vehicle-related fees are mostly used on freeways. If you pay income tax you are already helping paying for the roads you are cycling on, and you cause the roads no damage (can’t say the same for cars). Most cyclists also own a car and have driver’s license, and we are already paying MORE than our fair share since every time we cycle instead of drive we use less of the road and contribute nothing to its damage. It is onerous that some drivers want cyclists to pay the same fees they do when they are the ones damaging the roads and causing congestion.